India’s Honorable Prime Minister Narendra Modi launched Aadhar card based mobile payment app called BHIM App (Bharat Interface for Money). The app is simpler or modified version of previously launched UPI app. 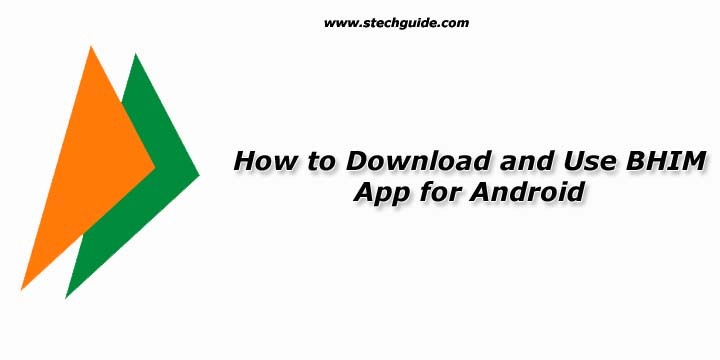 Here we discuss How to Use and Download BHIM App for Android phone. The app has simpler and clean UI and has the only 2MB in size, and the best part is you even won’t need an Internet connection to use this app. Download BHIM App for Android phone from before. BHIM App is developed by the National Payment Corporation of India (NPCI) and one more steps for PM Modi’s Cashless and Digital India. You don’t need a debit card, Internet connection or any smartphone, just download BHIM app from play store and use it or you can also access it via USSD by dialing *99# from any phone. Download BHIM App for Android phone from below. What is Aadhar based BHIM App? BHIM (Bharat Interface for Money) is an aadhar card based payment solution. The is made to enable fast, secure, and reliable cashless payments through your mobile phone. The app lets easy and quick let you send or receive payment transactions using UPI. It is differ from Mobile wallets and you don’t have to fill-out the lengthy bank account details again and again. You can easily make direct bank to bank payments and instantly collect money using just Mobile number or Payment address. Money can be sent or received digitally through biometric scanners without swiping your card. You can check your bank balance and transactions details on the go. How to Install and Use Bhim App? To use Aadhar based Bhim service users need to dial *99# from their mobile phone (work on every phone). It will not require internet access for the payment interface using USSD. You can also Download Bhim App for Android from above and follow below steps. Download Aadhar based Bhim App from above. Click on Install button to install the app. Now open the app and select your preferred language. If it asks for permissions, click on Allow button. Now Tap on “let’s get started” and verify your mobile number. Select the Sim card (Choose SIM 1) in case you have a dual sim mobile. Click on next verify your mobile number. Now Create a 4 digit pass-code and again type to Confirm the pass-code. Now Select your bank you want to use with this app. Now you need to entering Last 6 Digits of Debit Card Number & Expiry detail. After Successful Registration in BHIM APP, You will get Confirmation details to Send or receive Money. First, you need to Register your bank account with BHIM app and set a UPI PIN for the bank account. Your mobile number is your payment address (PA), and you can simply start transacting. 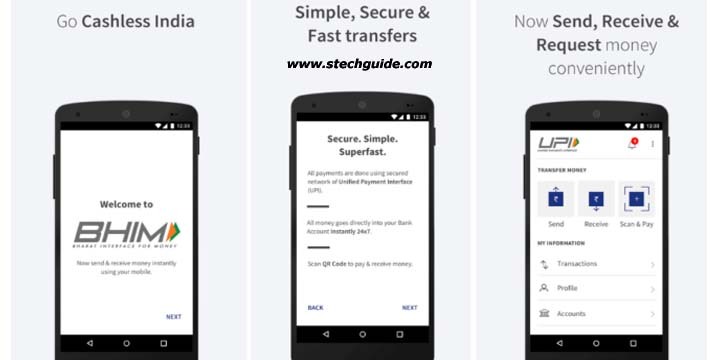 How to Send or Receive Money from Bhim App? Sending money to Other Bank – You can quickly send money using BHIM app by using the phone number or the payment address of the recipient (If the recipient is registered with UPI) or by entering the recipient name, account number and IFSC code. Request Money from Other – You can request money from anyone using by entering the mobile number or payment address or by generating a QR code for a particular amount. Scan and Pay – BHIM app allows you to generate a QR code which can be scanned by others to make payments. The transaction limit of Bhim App is a Maximum of Rs. 10,000 per transaction and Rs. 20,000 within 24 hours. BHIM App works on every phone. If you are using Featured phone, then you can dial *99# from their mobile phone. It will not require internet access for the payment interface using USSD. You can also Download Bhim App if you are using Android device. Are there any extra charges for Sending or Receive Payment via BHIM? There are no charges for making the transaction through Bharat Interface for Money. UPI-PIN (UPI Personal Identification Number) is a 4 to 6 digit secret code you create/set during a first time to registration with this App. You have to enter this UPI-PIN to authorize all bank transactions. You can set your UPI PIN by going to Main Menu -Bank Accounts -Set UPI-PIN for the selected account. You will be prompted to enter the last 6 digits of your Debit/ATM card along with the expiry date. You will then receive an OTP which you will enter and set your UPI PIN. This is the easiest way to Download and Use BHIM App on Android device. If you have any doubts while using or installing BHIM app then comment below. Can i send/pay money to a PTM registered number(who don’t have any BHIM app) by BHIM app? Kindly reply. You can send it anyone using IFSC code. To Paytm you can’t only bank transfer.